Two day time classes have been scheduled at the Auburn location in October. One will be in the morning and one will be in the afternoon. Check out the date, time, and pictures below. The calendar for Sips n Stokes Tuscaloosa is now up for October! Check out the new, exciting selections and originals by Wendy LoVoy. We can't wait to see you and your group for a fun night out Sips n Strokes style! Sign up today; spots are filling up fast! October Calendars are now online for Hwy 280, Pelham, Trussville and Vestavia locations. Attention All Sips n Strokers!! The October Calendars are now online for Hwy 280, Pelham, Trussville and Vestavia locations. All Twilight Fans we have a bunch of twilight paintings for you this month!! All Football Fans we have plenty of Football paintings!! On Sunday’s at Hwy 280 location only you can come paint with Wendy LoVoy. Times & price will vary week to week depending on the painting she will be teaching. Hope everyone enjoys the October Calendar. Don’t forget we are heading into the Christmas Season and what a great gift a painting by you will make as a gift!! Don’t forget we also sell gift cards for those of you that would like your friends and families to try Sips n Strokes!! Gift cards can be purchased online or at each of the locations. The Auburn location will be painting the Twilight Flower this Wednesday, 9/23/09. There will also be 2 tickets for this weekend's game against Ball State given away during the class. You can register by clicking on the picture. Some people believe artistic ability is a talent you are born with. Others think it is a complicated craft that few people can master. Wendy LoVoy knows otherwise. Her mission is to unleash the wannabe artist in all of us. It’s Wendy LoVoy’s unique outlook that caused her to leave the corporate world and pioneer a whole new way to appreciate and enjoy art. The mother of two, who proudly jokes that she’s ‘not Bob Ross with a fro,’ was teaching an art class to kids when she noticed a four-year-old’s spot-on rendition of a Degas. On a whim, she entered it in a silent auction and it sold for $500. It was then that she realized anyone was capable of creating beautiful art - now all she had to do was convince others. When Birmingham-based artist, Wendy LoVoy conceptualized Sips n Strokes, she had a vision of empowering creativity. She wanted everyone to understand that even people who think they can’t draw stick figures, could in fact, be artists. Sips n Strokes seemed like the perfect way to invite the artistically hesitant as well as the experienced artist to a paint class. The ‘sips’ part of the experience helps clients relax and enjoy painting. Wendy opened her first Sips n Strokes location with no financial backing, just sheer determination to give others a creative outlet. The concept was basic, yet ingenious. People from all across Alabama started flocking to the expanding Sips n Strokes locations – often with a bottle of wine in tow. Clients come for an interactive paint class where they arrive with their favorite beverage and leave with an art masterpiece. During classes, you’ll often hear Wendy yell over the chatting bunch, “Listen up, if you jacked up your painting raise your hand! Don’t be embarrassed, we’ll fix anything you screwed up.' From moms to groups of singles to sororities and even guys looking for a great place to meet women, each class features a diverse group of people who are looking to relax and have fun. Her enthusiasm for art and life makes every moment with Wendy a unique experience. She encourages those around her to try new things and never let anything stand in their way. After all, this is a woman who can paint as easily with her toes as her hands, looks forward to waking her unsuspecting husband up with wrestling tackles and recognizes that art can transform the lives of all who experience it. Her easygoing demeanor and contagious enthusiasm has made Wendy a local celebrity in Birmingham, where strangers approach her in grocery stores, restaurants and the airport. The University of Alabama graduate has a passion for giving back to her community. Now, when sick and injured kids enter the doors of Children’s Hospital of Birmingham, Wendy helps them transform into artists. Each child is greeted with an art cart filled with crayons, markers and other fun goodies that help them forget how much they’re hurting. Helping is second nature to Wendy, who has raised $70,000 in the last two years for the art supplies, and also donates her original pieces of art to decorate the hospital walls. She is an accomplished artist and the founder of Sips n Strokes, an interactive bring-your-own-beverage paint class that has locations across the South. Wendy has spent the last seven years using her passion for art to give back to the community. In August of 2006, her youngest son was rushed to Children’s Hospital for emergency brain surgery. Upon seeing the staff’s compassion for children, she knew she wanted to give back to the organization. Wendy created “Visions of the Masters,' an annual art auction where she and her students auction off original pieces of artwork. All the proceeds go to furnishing art supplies and art programs for the patients at Children’s. Wendy, who spends the entire year collecting and creating artwork for the charity event, learned the importance of giving back to the community from her grandfather. As a child, she and her siblings would tag along as he dressed as Santa and visited underprivileged children in the community. When she was in high school, he got them involved with the Special Olympics. Witnessing the impact he made in the lives of others gave Wendy the desire to do the same. The hospital takes in children regardless of whether their parents can pay for hospital care. Many patients come from rural areas where their schools don’t have art programs. The art carts are not only therapeutic to the kids, they’ve also helped some discover an untapped talent. From holding fundraisers at local schools to promote their art programs to her work with Camp Smile a Mile, a non-profit organization in Alabama for children who have or have had cancer, Wendy’s work with Children’s Hospital is only one of many ways she has given back. Her hope is that through Sips n Strokes, she can bring awareness to the causes she supports. When she’s not pursuing art, Wendy enjoys spending time with her husband and two sons, and finding new music that inspires her to be creative. Nicole Allshouse, host of “Talk of Alabama”, interviews Wendy LoVoy as they walk through her home and personal studio for the very first time for everyone to take a peek and get some great tips on how to decorate your home with color and art. Nicole Allshouse, host of “Talk of Alabama”, will interview Wendy LoVoy as they walk through her home and personal studio for the very first time for everyone to take a peek and get some great tips on how to decorate your home with color and art. Don’t miss it!! If you can’t watch the live show from 9-10:00am then go to www.talkofalabama.com and watch it online!! They will post it online no later than 12:00pm tomorrow. Come paint a special class on this Sunday with Wendy LoVoy as she teaches the “Legend” and be apart of the ABC 33/40 filming that will be aired live with Wendy LoVoy on the Monday morning show on ABC 33/40. Seating is limited so register now!! On September 29th at the Hwy 280, and the Vestavia stores a portion of the evenings proceeds will be donated to the $100k for Kids Day. Coupons will not be accepted for these classes. For more information about $100k for Kids Day please click here to go to Children’s Hospital of Alabama. Every dollar given to $100k for Kids Day will go towards making a difference for thousands of ill and injured children. On Tuesday, September 29, Children’s Hospital of Alabama needs your help to raise $100,000 in 24 hours. Come out September 29th to the Hwy280 or Vestavia store enjoy a night out and help make a difference Sips n Strokes style! This Thursday night's painting has been changed to "Tiger Eyes", an original by Wendy LoVoy. Come join us this night to paint this amazing piece of art. Don't forget Christmas is just around the corner. "Tiger Eyes" will make a great gift for that special Auburn fan in your life! Sips n Strokes BHM - $20.00 Class Special Tuesday & Wednesday this week only!!! for only $20.00 per person!! Hwy 280, Vestavia, Trussville and Pelham Locations only! 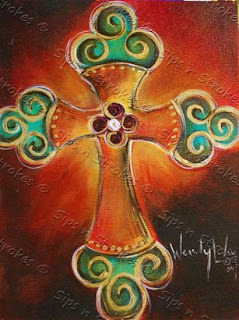 Paint with Stacy on Labor Day for $20 "Joyful Christmas"
Get an early start on Christmas at the East Cobb studio. Join us at the East Cobb studio on 9/8 to raise money for the America Heart Association. Replace the "Abstract Cirlces" with Abstract Hears... Stacy Abston will be teaching this class. A portion of the evenings proceeds will be donated to the AHA. Sips n Strokes is a great place to host your fundraisers. If you are interested in having a fundraiser at our Birmingham (Hwy 280, Vestavia, Trussville and Pelham) and Atlanta locations please contact us at givingback@sipsnstrokes.com . Please let us know the cause and location that you want to have this hosted and we will get back with you for more details and how we can help.